The global market for corn starch is highly competitive in nature with the rising number of key players entering the market, states a research report by Transparency Market Research (TMR). The leading players in the global market are emphasizing on innovation and improvement of the distribution network in order to create a niche and sustain in the competitive scenario of the corn starch market across the globe. Some of the leading players operating in the market are Kent Corporation, Cargill Inc., Archer Daniels Midland Company, and Associated British Foods plc. The expansion of the application base is likely to contribute towards the development of market and benefit the key players in the next few years. In addition, the leading players are focusing on providing cost-effective solutions, which is likely to accelerate the growth of the overall market in the coming years. According to the research study by Transparency Market Research, in 2016, the global market for corn starch was worth US$22.1 bn. The market is anticipated to exhibit a healthy 4.80% CAGR between 2016 and 2024. From a geographical viewpoint, the North America market for corn starch led the overall market in the last few years. As per the study, this region is expected to maintain a dominating position over the forecast period in terms of volume as well as value. On the contrary, Asia Pacific is projected to register a healthy 6.40 % CAGR between 2016 and 2024. The high growth of this region can be attributed to the increasing contribution from India, China, and ASEAN countries. In addition, the presence of leading corn starch manufacturers in this region is another factor accelerating the growth of the market. 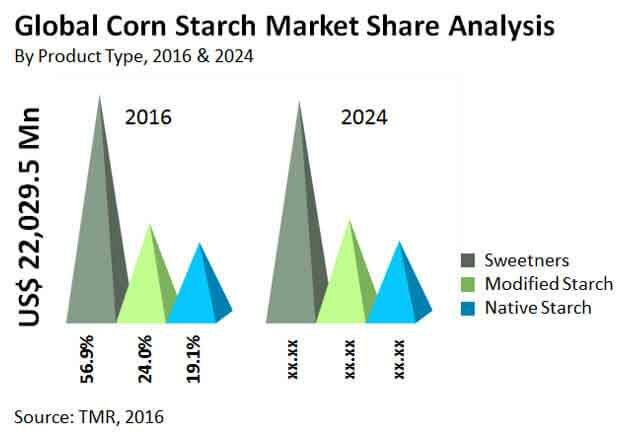 The global corn starch market has been classified on the basis of product type into modifies starch, sweeteners, and native starch. At present, the sweeteners segment accounts for more than 50% share of the global corn starch market and is likely to remain in its leading spot throughout the forecast period. The rising use of high fructose corn syrup in a wide range of food and beverages is expected to fuel the growth of this segment in the next few years. The modified starch segment, on the other hand, is estimated to register a significant growth in the next few years. The increasing use of corn starch in several industries, such as processed foods, detergent industries, food and beverages, and paper and board is expected to fuel the growth of the global market in the next few years. In addition, the increasing awareness among consumers regarding the health benefits of consuming corn starch is likely to accelerate the growth of the market in the near future. The expansion of the application base and technological advancements in the field of biotechnology are some of the other major factors projected to supplement the growth of the global corn starch market in the forecast period. On the other hand, the easy availability of corn substitutes, including tapioca and wheat is estimated to restrict the growth of the global corn starch market in the next few years. Moreover, the rising use of Cassava is another factor likely to hamper the growth of the market in the near future. However, the key players in the global market are focusing on introducing corn-starch-based products, which will act as a raw material for 3D printing plastics and in bio-plastics sector. This is projected to generate lucrative opportunities for key players operating in the global corn starch market in the forecast period.